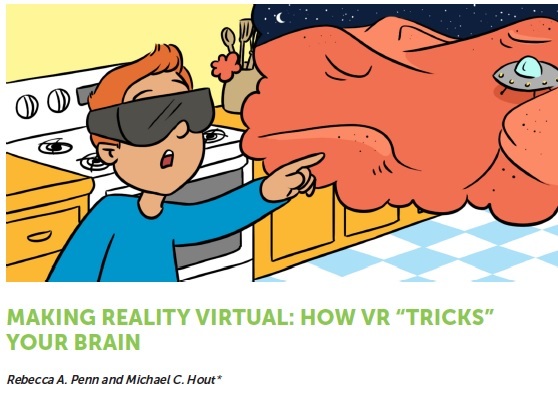 April 24th, 2019: Last week, I gave an invited lecture (at the invitation of the Centre for Vision and Cognition) at the University of Southampton (in England). 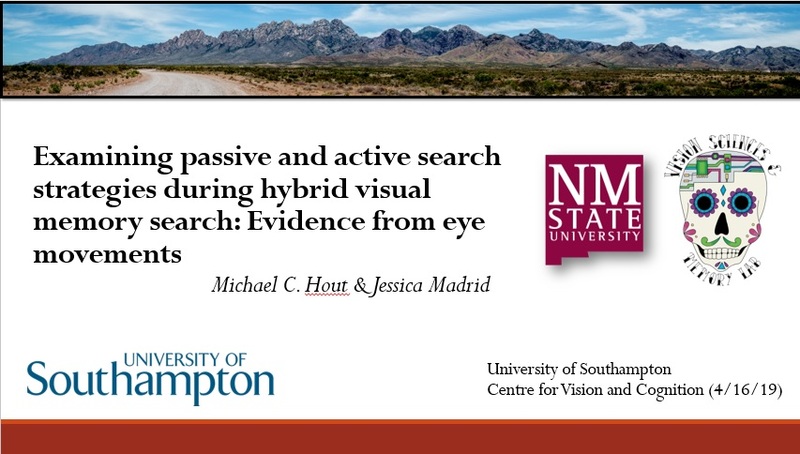 I was quite excited to go back to Southampton, and to give a talk on our recent work in hybrid visual memory search and eye movements called “Examining passive and active search strategies during hybrid visual memory search: Evidence from eye movements.“ Thanks to my collaborator, Jessica Madrid, whose thesis work formed the basis of this talk! March 12th, 2019: It looks like this year, we’ll have a pair of Discovery Scholars students presenting their work at the NMSU Honors College Undergraduate Research and Creative Arts Symposium (URCAS). Kitt Phi will present our poster (in collaboration with Rebecca Penn, Phil Post, Saleem Masadeh, and myself) entitled “Simulating an open terrain visual search environment in three-dimensional virtual reality.” And Rene Mcpherson will present our poster (in collaboration with Hailey Sandin, Edin Sabic, and myself) called “Creation of a large, open-access database of complex visual scenes for use in experimental psychology.” Congrats, all! 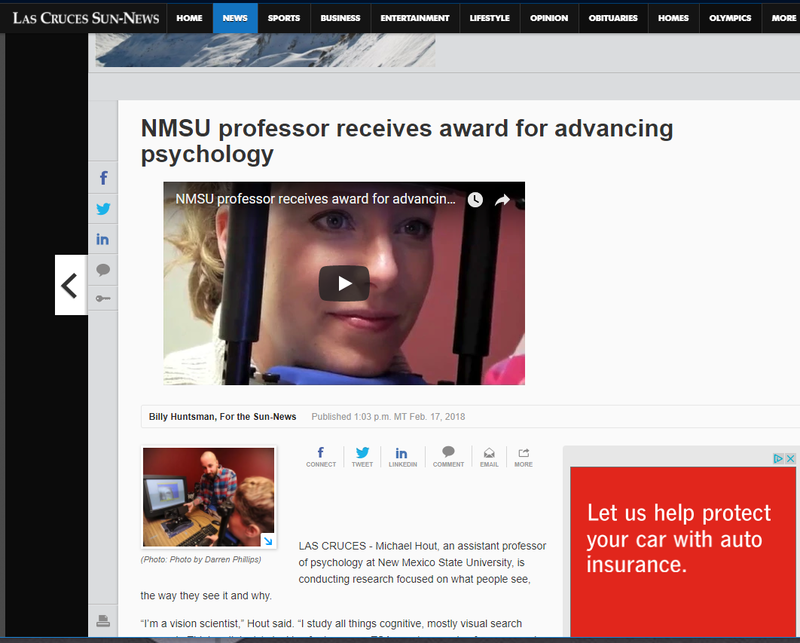 February 19th, 2019: I’ve just been selected as the NMSU College of Arts and Sciences “Department Star“ for the Psychology Department. I’m very honored to receive this recognition, and look forward to the reception event on April 5th! February 18th, 2019: A pair of Discovery Scholars students just joined our team. Hop on over to the homepage to learn more about Victoria Arvizu and Rene Mcpherson! February 18th, 2019: We’ve just had a talk accepted to this year’s Midwestern Psychological Association conference in Chicago. Arryn Robbins will present our paper, titled “Scene context facilitates search for heterogeneous categories.” Congrats, Arryn! February 13th, 2019: We’ve just had a poster accepted to this year’s Association for Psychological Science meeting in Washington DC (in May). Arryn Robbins will present a poster on our upcoming database, “The Pictures by Category and Similarity (PICS) Database: A database of 1200 pictures from 20 object categories rated for similarity using multidimensional scaling.” Congrats to co-authors, Justin MacDonald, Ashley Ercolino, Joe Schmidt, and Edin Sabic! February 11th, 2019: Our newest Discovery Scholar to join the lab is Sydney Luna, who will also be contributing to our search and rescue “clue finding” projects. Check out the homepage for more info on Sydney! February 6th, 2019: We have yet another Discovery Scholar joining the lab. Christine Dellefield-Lopez will be joining us to work on some research pertaining to search and rescue “clue finding.” Check out the homepage for info on Christine! February 6th, 2019: We have another person joining our team. 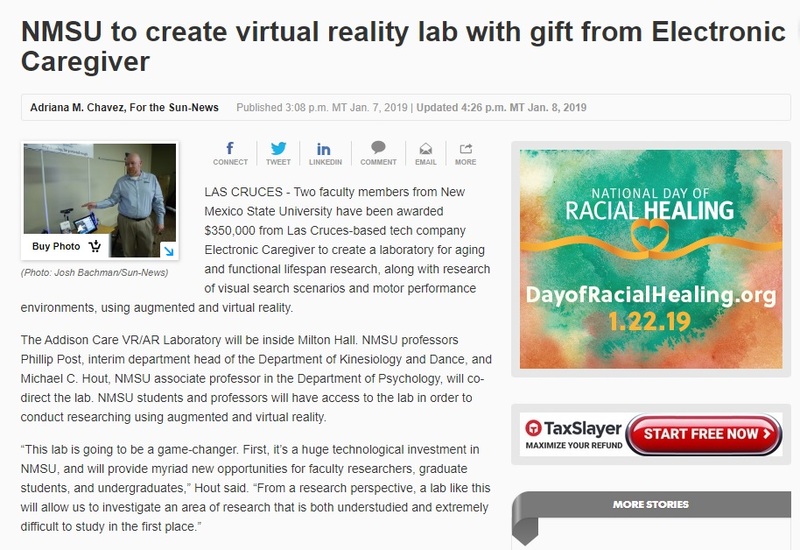 Kitt Phi will be joining the lab, both as a Discovery Scholars researcher and as a paid work-study programmer for our work in the upcoming Addison Care Virtual and Augmented Reality Laboratory (for which Phil Post and I are co-directors). Hop over to the homepage to learn more about Kitt! February 5th, 2019: We have a new person joining the lab! Asia La Torra will joining the lab as a Student Assistant to the Discovery Scholars Program. She’ll help us keep the programming running smoothly. Check out the homepage of my site for more information on Asia! 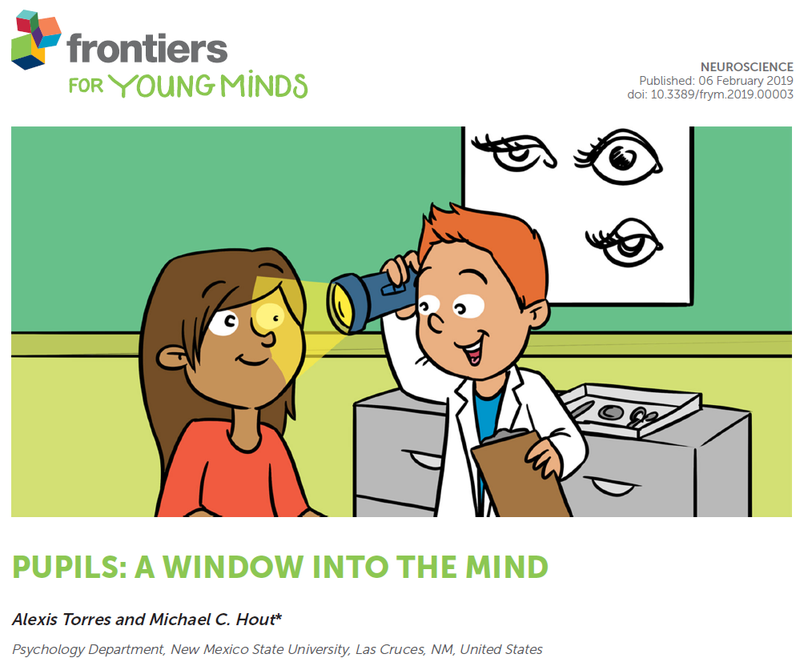 February 5th, 2019: We’ve just had a poster accepted to this year’s Vision Sciences Society meeting in St. Pete, Florida. Arryn Robbins will present our poster, “Using multidimensional scaling to quantify category heterogeneity effects in visual search.” Congrats to co-authors, Kory Scherer, Edin Sabic, Justin MacDonald, Ashley Ercolino, and Joe Schmidt! November 5th, 2018: Congratulations to Jessica Madrid for successfully passing her comprehensive exams! Now on to the PhD. October 30th, 2018: Audrey Morrow traveled to Albuquerque, NM to present our research at the New Mexico Academy of Science Research Symposium. She presented our poster, entitled, “The effect of transcranial direct current stimulation (tDCS) on audition”. 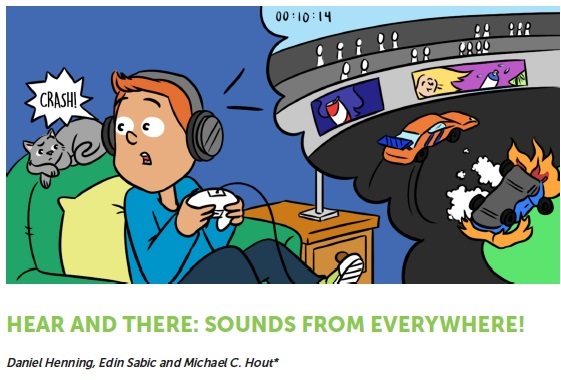 Our collaborators for this project were Amie Amiotte and Justin MacDonald. October 16th, 2018: Congratulations to Edin Sabic for passing his comprehensive exams! Next up, dissertation. September 20th, 2018: We’ve just gotten word that our posters were accepted to the 2018 Object Perception, Attention, and Memory conference in New Orleans, Louisiana. This is particularly exciting because our posters span both graduate (Jessica Madrid, Rebecca Penn, and Bryan White) and undergraduate (Alexis Torres) members of our lab. Jessica will present a poster entitled “It’s all a blur: Partial visual information triggers logarithmic decision making during object recognition.” Rebecca will present a poster called “Getting a clue: Visual search in open terrain environments.” Congrats, all! July 20th, 2018: We’ve just had a pair of posters accepted to the 2018 Annual Meeting of the Psychonomic Society in New Orleans. Jessica Madrid will present our work on strategy use during search in a poster titled “Looking for the one: Passive strategies improve guidance and object recognition in single-target search.” And Collin Scarince will present our modelling work in a poster titled “An update to the Guided Search model using multi-dimensional scaling to capture the features of complex, real-world objects.” Congrats, all! July 9th, 2018: I’m thrilled to announce that we have a second PhD student to graduate from our lab this year: Dr. Collin Scarince. 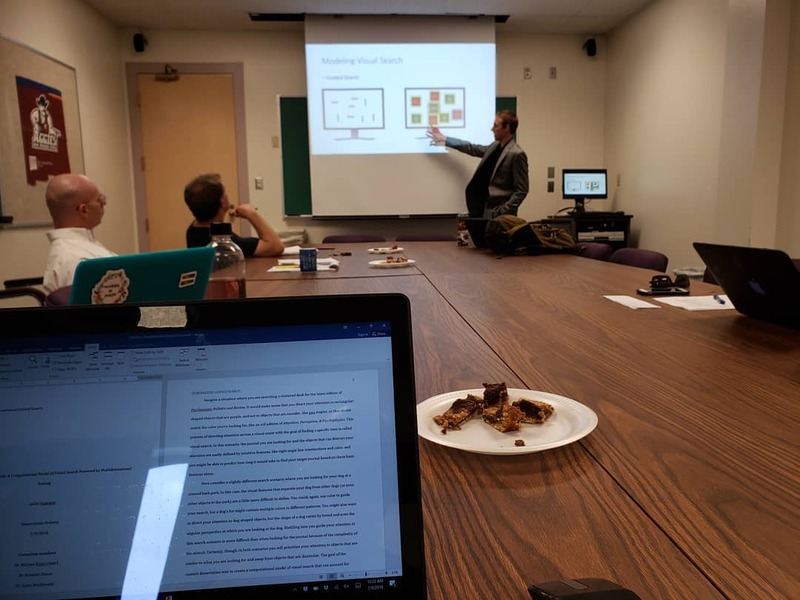 Collin successfully defended his dissertation today, titled, “Generalized Guided Search: A computational model of visual search powered by multidimensional scaling.” We’re proud of Collin, and excited for what’s next in his career. June 14th, 2018: I’m very pleased to announce that the first PhD student to graduate from our lab, Dr. Arryn Robbins, will soon be a post-doctoral researcher. She has accepted a position at Carthage College, working with Dr. Anthony Barnhart and Dr. Leslie Cameron. I’m thrilled that she’s on her way to such a great position, and am confident she’ll do great things at Carthage. May 24th: 2018: I’ve been invited to be a funded presenter at the 4th Symposium on Visual Search and Selective Attention in Munich, Germany (http://mvss.org/). This is a very prestigious honor for me, as I’ll be speaking alongside an incredibly well-respected and impressive group of academics who all share my research interests. 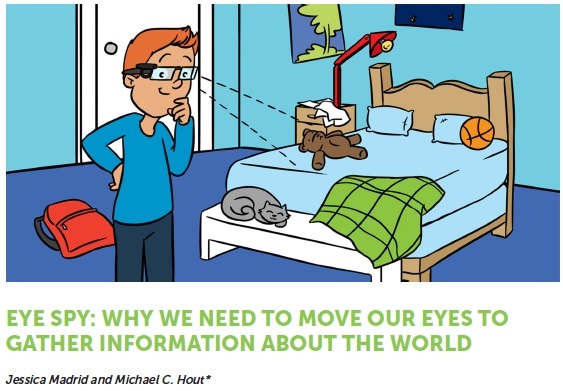 In July, I’ll present the work Jessica Madrid and I have been working on, titled “Passive search strategies improve attentional guidance and object recognition during demanding visual search.” I can’t wait. 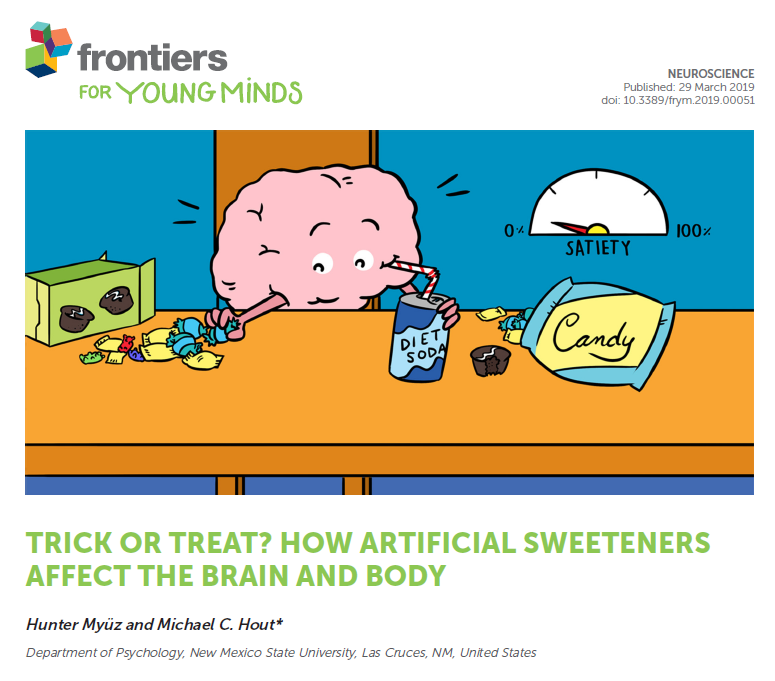 May 24th, 2018: I’ve recently been invited (by the Environmental Neuroscience Laboratory: http://enl.uchicago.edu/) to speak at the University of Chicago. I’m very excited to travel to Chicago to speak with this excellent group of academics about our recent work on strategy use in visual search. April 26th, 2018: I just received my official letter stating that I’ve been granted promotion and tenure. As of August 2018, I will be a tenured Associate Professor. I’m very excited to have this milestone behind me, and appreciate all the support I’ve had at NMSU to get me here. April 23rd, 2018: This Friday (4/27/2018), Emily Green (an honors thesis student working in our lab) will present our research incidental memory work at the Undergraduate Research and Creative Arts Symposium (URCAS) here on campus. If you’re around on Friday, swing by and see her present! The title of the poster is “Challenging visual search creates better incidental memories for objects and their perceptual features.” Good luck, Emily! April 5th, 2018: I’m very pleased to announce that the first PhD to come out of our lab is the wonderful Dr. Arryn Robbins. Arryn successfully defended her dissertation, “The role of context and exemplar variability in shaping the categorical search template.” We’re all quite proud of her, but will be sad to see her go! March 20th, 2018: I’ve just gotten word that I will be a panelist at the 2018 NMSU Assessment Conference (Writing to Think). I will be part of a presentation titled, “Writing to learn? It’s not just for writing courses!” Come check out the conference, and learn about ways to improve the writing components of your courses. March 13th, 2018: We’ve just had a new paper accepted to the open access journal Sage Open. Our paper is titled “Simulating the fidelity of data for large stimulus set sizes and variable dimension estimation in multidimensional scaling.” Congrats to my co-authors, Corbin Cunningham, Arryn Robbins, and Justin MacDonald! March 8th, 2018: We’ve just had a pair of posters accepted to this year’s North American Society for the Psychology of Sport and Physical Activity meeting in Denver, Colorado (in June). Our collaborators include Dr. Phil Post, Dr. Chris Aiken, and Ms. Jessica Madrid. Phil will present our poster titled “Learner-controlled pace of practice in isolation does not yield the self-control effect.” And Chris will present our poster called “Learner-controlled amount of practice with fixed inter-trial interval benefits learning.” Congrats, all! February 13th, 2018: At this year’s Rocky Mountain Psychological Association meeting in Denver, CO, we’ll have a trio of talks to present. In collaboration with Emily Green, Juan Guevara Pinto, and Dr. Megan Papesh, I’ll be giving a talk called “Challenging visual search creates better incidental memories for objects and their features.” Arryn Robbins will be giving our talk called “Scene context can facilitate search for imprecisely specified targets.” And John Kulpa will present our talk “Evaluating SpAM and multi-trial spatial arrangement methods of estimating subjective similarity” in collaboration with myself and Dr. Dom Simon. 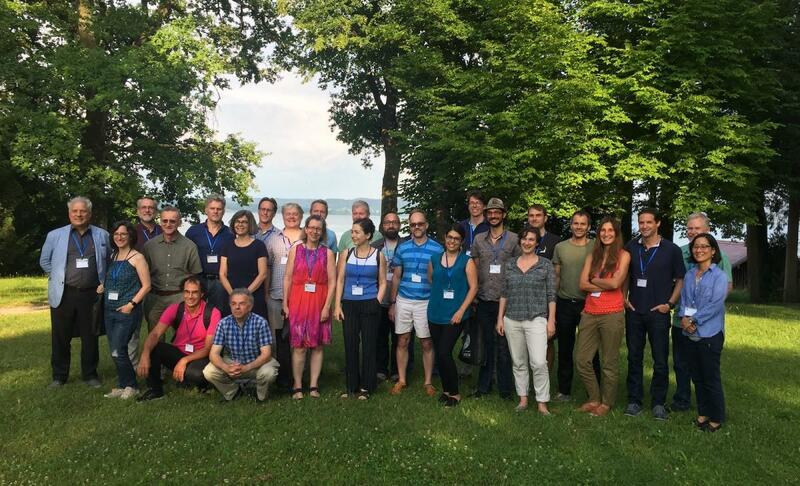 Congrats, collaborators! February 12th, 2018: This year, we’ll be presenting a poster for the first time at the Annual Convention of the Association for Psychological Science. John Kulpa will be presenting our poster, titled, “Evaluating SpAM and multi-trial spatial arrangement methods of estimating subjective similarity.” Congrats to John and our co-author, Dr. Dom Simon! February 10th, 2018: We’ve just had a poster accepted to this year’s Vision Sciences Society meeting in Florida. Arryn Robbins will be presenting our poster, titled “Scene context influences expectations about imprecisely specified search targets.” Congrats, Arryn! January 8th, 2018: I’m happy to say that I’ve started consulting for Major League Baseball, as part of their Umpire Training Program. Over the next year, I will consult with the MLB regarding a variety of training programs aimed at increasing the perceptual skills of MLB umpires.